We have a full range of options to help, should your pet become ill. We have a full in-house laboratory that allows us to run about 90% of any needed bloodwork here the same day so that we can get faster results and begin treatment sooner. Additional or specialized tests are submitted to a local lab in Olathe. Our facilities also allow us to perform any needed x-rays to look for foreign bodies, tumors, broken bones and many other things. Our fully stocked pharmacy allows us to treat most conditions and illnesses, as well as the ability to have other medications delivered same or next day if needed. We have the ability to diagnose any ailment that does not require specialized diagnostics, such as MRI’s. If we find ourselves in this situation, we have wonderful local referral hospitals where that testing can be performed. If your pet is sick and requires hospitalization overnight or for multiple days we are able to accommodate in situations that do not require critical care. 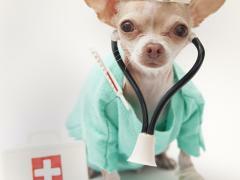 Pets that are hospitalized stay in our treatment room where close observation and care can be provided. This is the same area our recovering surgical patients stay.